Our immune systems help us fight off diseases and invasions of our bodies by foreign organisms. How surprising might it be to learn that our immune systems actually help tumors spread through our bodies? Dr. Karin de Visser and her team at the Netherlands Cancer Institute have discovered that breast tumors cells induce certain immune cells to enable the spread of cancer cells. They published their findings online on March 30 in the journal Nature. About one in eight women will develop breast cancer in Western countries. Of those women who die of this disease, 90 percent of them die because the cancer has spread to other parts of their body and formed metastases. Given these grim facts, cancer researchers are spending a good deal of time, treasure and energy to understand how metastasis occurs. A few years ago, several cancer biologists reported that breast cancer patients who showed high numbers of immune cells called neutrophils in their blood show an increased risk of developing metastatic breast cancers. Immune cells like neutrophils are supposed to protect our body. Why then are high neutrophil levels linked to worse outcome in women with breast cancer? 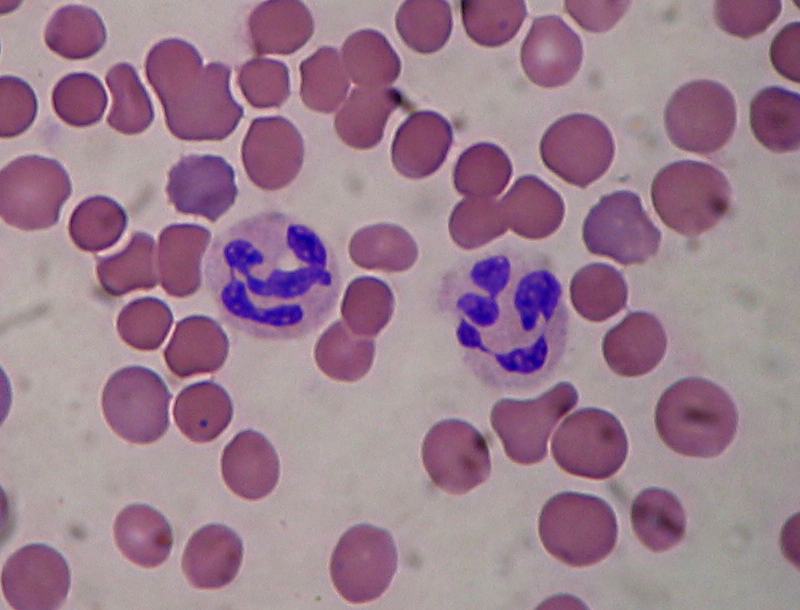 Neutrophils in a blood smear amidst red blood cells. Dr. Karin de Visser, group leader at the Netherlands Cancer Institute, and her team discovered that certain types of breast tumors use a signaling molecule called Interleukin-17 to initiate a domino effect of reactions within the immune system. The tumor cells stimulate the body to produce lots of neutrophils, which typically occurs during an inflammatory reaction. However, these tumor-induced neutrophils behave differently from normal neutrophils. These tumor-induced neutrophils block the actions of other immune cells, known as T cells. T cells are the cells that can (sometimes) recognize and kill cancer cells. Inhibiting neutrophils would not be a prudent clinical strategy, since drugs that inhibit neutrophils would make patients susceptible to all kinds of infections. However, Inhibition of IL-17 might be a safer strategy. Fortunately, drugs that inhibit IL-17 already exist. Presently, anti-IL-17 drugs are being tested in clinical trials as a treatment for inflammatory diseases, like psoriasis and rheumatism. Last month, the first anti-IL-17 based therapy for psoriasis patients was approved by the U.S. Federal Drug Administration (FDA). “It would be very interesting to investigate whether these already existing drugs are beneficial for breast cancer patients. It may be possible to turn these traitors of the immune system back towards the good side and prevent their ability to promote breast cancer metastasis,” De Visser says. Chronic liver disease is the fifth leading cause of death in the United Kingdom. With the long-standing shortage of donated, transplantable livers, the prognosis of such patients seems grim. Several preclinical studies in animals have established that mobilization of bone marrow stem cells or direct injection of bone marrow stems into a damaged liver can augment healing and improve survival (Sukaida I, and others, Hepatology 2004;40:1304–11; and Yannaki E, and others, Exp Hematol 2005;33:108–19). Some small clinical trials have examined the use of a patient’s own bone marrow stem cells to prime the liver and stimulate its own internal healing mechanisms. These studies were small and varied in the manner in which the stem cells were delivered, but they di show that the stem cell treatments were safe and even improved the health of the liver significantly (Gordon MY, and others, Stem Cells 2006;24:1822–30; Terai S, and others, Stem Cells 2006;24:2292–8). Also, in patients with liver cancer who had to have portions of their livers removed, bone marrow stem cell treatments accelerated liver healing (am Esch JS, and others, Ann Surg 2012;255:79–85; am Esch JS, and others, Stem Cells 2005;23:463–70; and Furst G, and others, Radiology 2007;243:171–9). Clearly there is a need for a larger, more systematic study of the efficacy of bone marrow stem cells as a therapeutic agent in patients with liver failure. To that end, Philip Newsome and his colleagues at the University of Birmingham, in collaboration with colleagues from Scotland, Newcastle, and Nottingham have initiated the REALISTIC trial, which stands for REpeated AutoLogous Infusions of STem cells In Cirrhosis. This is a multi-center clinical trial and it will examine patients with Cirrhosis (fatty liver disease), regardless of the cause of that liver disease. Patients whose livers were damaged by excessive alcohol use, hepatitis B or C infections, or genetic conditions are all eligible for this study, but anyone who liver is too far-gone to be helped by a treatment like this or has had a liver transplant is not eligible. Patients will receive injections of a drug called lenograstim (G-CSF) to mobilize bone marrow stem cells into the blood. These blood-based stem cells will then be collected and concentrated, and then implanted into the liver. Patients will be assessed at 3 months after the treatment and then followed-up for 1 year. Liver health will be assessed by means of medical imaging of the liver and various blood tests. Patients will be evaluated using the Model for End-Liver Disease or MELD scoring system. Secondary tests will measure the degree of liver scarring, the degree of liver stiffness, blood tests, survival, and liver function. Patients will also be placed into three groups. One group will only have the bone marrow stem cells mobilized from bone marrow without being collected. Another group will have the cells collected and implanted into the liver. The third group will receive standard care with not stem cells treatments. There is a need for a study like this. I only hope that Newsome and his group can recruit the patients and get started collecting data as soon as they can. Cancer patients usually have three different options: surgery, chemotherapy and radiation therapy. None of these options elicits a great deal of confidence. A new study at City of Hope will officially open the Alpha Clinic for Cell Therapy and Innovation. At this center, patients battling cancer and other life-threatening diseases will have another option: stem cell-based therapy. The Alpha Clinic, which officially opened March 19, is funded by an $8 million, five-year grant from the California Institute for Regenerative Medicine. This grant will also be supplemented by matching funds from City of Hope. The Alpha clinic will combine the uniquely patient-centered care for which City of Hope is well-known with the most innovative, stem cell-based therapies being studied to date. This approach will hopefully revolutionize the treatment of not only cancer, but also AIDS and other life-threatening diseases. The christening of City of Hope’s Alpha Clinic is the culmination of a decade of planning and visionary thinking. When the state of Californian voted to found the California Institute for Regenerative Medicine, the funds now became available to start the institute. New stem cell therapies are ready for clinical trials, and City of Hope is home to one of three Alpha Clinics in the state. The other two clinics are at the University of California San Diego and a joint clinic by University of California Los Angeles and University of California Irvine. City of Hope’s first trials will study stem cell-based therapies for leukemia, and the use of neural stem cells to deliver treatments to brain tumors. The first such study will modify a patient’s own immune cells so that they can recognize and fight cancer cells. Cancer researchers hope the modified cells will be able to attack existing cancer cells, and also be able to attack the cancer again should it recur. Brain cancer patients will also be able to enroll in a study that uses neural stem cells, which have an innate ability to home to tumor cells, as a delivery mechanisms for cancer drugs. Genetically engineered neural stem cells can bring targeted therapies across the blood-brain barrier, and can potentially deliver drugs directly to tumor sites, which eliminates systemic toxicity. The US Food and Drug Administration (USFDA) has already approved a new HIV trial that will be conducted at the City of Hope Alpha Clinic. This trial will use “molecular scissors” known as zinc finger nucleases to edit the blood cells of HIV patients and remove a specific gene. Without this particular gene, the cells are unable to produce a protein that HIV requires in order to invade cells and replicate. The approach has the potential to eliminate HIV from the body. The Alpha Clinic launched officially on March 19. Future trials will include T cell immunotherapy for blood cancer, new brain cancer therapies, treatments for breast cancer metastases and ovarian cancer treatments. Zaia said the clinic also plans to work with City of Hope’s diabetes researchers to introduce treatments for diabetes, exploring both the potential of pancreatic stem cells and preventing the immune system from attacking insulin-producing cells. A research team from the Spanish National Cancer Research Center (CNIO) has shown that partial pharmacological inhibition of the PI3K enzyme in obese mice and monkeys reduces body weight and physiological manifestations of metabolic syndrome, specifically diabetes and hepatic steatosis (fatty liver disease), without any signs of side effects or toxicities. They published their work in the journal Cell Metabolism. This collaborative project between the Tumor Suppression Group headed by Manuel Serrano at the CNIO (Madrid, Spain) and the Translational Gerontology Branch headed by Rafael de Cabo at the U.S. National Institute on Aging, National Institutes of Health (NIH, Baltimore, MD, USA), included the participation of the NeurObesity group of CIMUS led by Miguel Lopez at the University of Santiago de Compostela (Santiago de Compostela, Spain). PI3K (phosphatidylinositol-3-kinase) is the name of an enzyme that regulates the balance between the biosynthesis of cellular components and the burning of nutrients to make energy in cells. Specifically, PI3K promotes cellular growth and biosynthesis, which can lead to the induction of growth and multiplication of cells, and ultimately could lead to cancer. For this reason, scientists who investigate cancer have has a long-standing interest in designing pharmacological inhibitors of PIK3. CNIO, in fact, has developed its own experimental inhibitor, CNIO-PI3Ki, which is being studied for applications as a cancer treatment in combination with other compounds. As part of the characterization of the PI3K inhibitor and to understand how it affects the balance between the use and storage of nutrients in the body, the Serrano team decided to study the effects of CNIO-PI3Ki on metabolism. “At this point we have veered away from the original anticancer aspects of these inhibitors. In our previous studies, we had seen that one of the normal physiological functions of the PI3K enzyme is to promote the storage of nutrients. We found this to be of particular interest because it is precisely this type of manipulation, regulation of the balance between storage and use of nutrients, that is sought after in treating obesity,” explains Ana Ortega-Molina, the first author of the study, who is working at the Memorial Sloan-Kettering Cancer Center in New York. To test the effect of their PI3K inhibitor on metabolism, CNIO scientists administered small doses of the CNIO-PI3Ki inhibitor to obese mice for 5 months while those mice were fed a high-fat diet. During the first 50 days, the obese animals lost 20% of their body weight, at which point their weight stabilized. The treatment was administered for 5 months and during the whole time, these mice maintained a stable weight (20% below the weight of non-treated obese mice), despite continuing feeding with a high-fat diet. They also improved their pathological symptoms of diabetes (high glucose levels in the blood) and hepatic steatosis (fatty liver). “When it comes to obesity, constant weight loss can be extremely dangerous. The ideal solution is to alter the balance between the use and storage of nutrients, to strike a new balance in which there is greater use and less storage,” explains Elena López-Guadamillas who, in collaboration with Ana Ortega-Molina, carried out most of the experimental work. This study showed that the drug had no side-effects and did not produce irreversible effects on metabolism, which is also desirable for its possible future use as a treatment in humans. In non-obese animals that were fed a standard diet, the administration of the drug had no effect, which is another indication of its safety. “This shows that the activity of the PI3K enzyme is only relevant when there is an excess of nutrients, that is, a high-calorie or high-fat diet,” adds López-Guadamillas. CNIO scientists then collaborated with the U.S. National Institutes of Health (NIH) in order to test the CNIO-PI3Ki compound on obese monkeys (macaques). They used a very low dose to ensure higher safety margins, but even with these very high doses, the daily treatment of these obese animals over a 3-month period reduced the total amount of fatty tissue by 7.5% and improved the symptoms of diabetes. Obesity is one of the most important risk factors within the spectrum of serious diseases that constitute the metabolic syndrome. Many pharmacological agents have been discovered that lead to weight loss, but these drugs often have unacceptable toxic effects (partly due to the fact that these previous agents act on the brain centers that control appetite). In this respect, CNIO-PI3Ki seems to be the exception, at least in animal models thus far, as no such side-effects have been observed, even after long-term treatments (5 months in mice and 3 months in monkeys). 1) Selective: CNIO-PI3Ki only produces weight loss in mice that receive an excess of nutrients and not in mice that eat a normal balanced diet. This shows that PI3K plays an important role in the storage of nutrients when food intake is excessive, but is not so important under a normal diet. 2) Weight loss in the mice is due exclusively to loss of fatty tissue; no losses occur in other tissues such as liver, muscle or bone. 3) It does not affect the brain: CNIO-PI3Ki does not cross the blood-brain barrier. 4) It does not affect the hypothalamus: The hypothalamus is a specialized structure of the brain that is exceptional because it lacks a blood-brain barrier (a structure that controls the entrance of substances from the blood to the brain) and it controls many metabolic processes, including appetite and satiety. No effects on the main neuropeptides produced by the hypothalamus related to appetite and satiety have been noted in the mice. These last studies have been carried out in collaboration with the research group led by Miguel López at the University of Santiago de Compostela. 5) It works on a long-term basis: The effects of CNIO-PI3Ki were maintained over at least a 5-month period of treatment in mice, which suggests that resistance mechanisms are not developed. This is very important, as it is a common problem found in other compounds that affect metabolism. 6) Reversibility: The effects of CNIO-PI3Ki were reversible, which means that when the treatment was interrupted and a high-fat diet maintained, the mice regained weight. This indicates that CNIO-PI3Ki does not cause irreversible changes. The next logical step, once the beneficial effects of CNIO-PI3Ki have been demonstrated in obese mice and monkeys, is to perform clinical trials on humans. “The leap from animals to humans is complex, expensive and full of uncertainties. Many treatments that are promising in animals turn out not to be effective in humans or toxicities appear that were not observed in animals. But, obviously, in spite of the uncertainties, we have to give it a try,” says Manuel Serrano. “Clinical trials require large investments and are undertaken with the aim of marketing a treatment. We are very optimistic about the possibility of entering into an agreement soon with a multinational pharmaceutical company interested in carrying out clinical trials with CNIO-PI3Ki to treat obesity and metabolic syndrome in humans,” says Serrano. Regenerative therapies for the heart have come a long way from the first clinical trials and injected bone marrow cells directly into the heart muscle. Despite the modest improvements shown in those earlier studies, it became clear that the vast majority of cells that were implanted into the heart died soon after their introduction. This single fact left researchers looking for a better way to deliver cells into the damaged heart. Several laboratories have tried to condition the stem cells before their injection in order to “toughen them up” so that they do not tend to die so easily. While these experiments have worked well in laboratory animals, no clinical trials have been conducted to date with conditioned stem cells. Another strategy is to place the cells on a patch that is then applied to the dead heart tissue in order to promote healing of the heart. The patch strategy was employed by Hao Lai and Christopher Wang and their co-workers at the Shanghai Institute of Cardiovascular Disease in Shanghai, China. Lai and others extracted bone marrow stem cells from the bones of Shanghai white pigs. These cells were cultured, and genetically engineered to expressed IGF-1 (insulin-like growth factor-1). Once IGF-1 expression was confirmed, the cells were loaded onto a fibrin patch and placed over the hearts of Shanghai white pigs that had just experienced laboratory-induced heart attacks. There were four groups of pigs: 1) those treated with fibrin patches with bone marrow stem cells that were not genetically engineered; 2) another group treated with fibrin patches that contained genetically engineered bone marrow stem cells that did not express IGF-1; 3) fibrin patches containing bone marrow stem cells that had been engineered to express IGF-1; and 4) a control group that was not treated with any cells or patches. In culture, the IGF-1 engineered cells did not differentiate into heart muscle cells, and they did induce proliferation in Human Umbilical Vein Endothelial cells, which suggests that these engineered cells would induce the formation of new blood vessels. When transplanted into heart injured pigs, the IGF-1-expressing cells on a fibrin patch significantly reduced the size of the infarct in the hearts, and increased the thickening of the walls of the heart. Gene expression studies showed that the IGF-1-expressing cells on the fibrin patch induced anti-cell death genes that promote cell survival. These cells also induced the growth of many new blood vessels and seemed to promote the growth of new heart muscle, but the cells on the patch are almost certainly not the source of these new cells, but resident stem cell populations in the heart probably were. The increase in heart mass suggests that the implanted cells induced the resident stem cell populations in the heart to divide and differentiate into heart muscle cells. This new technique proved safe and effective. It prevented remodeling (enlargement) of the heart and promoted cell survival. It is a technique that shows promise, especially since the fibrin patch is biodegradable and the bone marrow stem cells will not last indefinitely in the heart. These cells simply work by serving as a platform for the secretion of IGF-1 and perhaps other healing molecules. Another caveat of this experiment is that the bone marrow stem cells were genetically engineered with lentivirus vectors. Because of the tendency for these vectors to insert genes willy-nilly into the genome, this is almost certainly not the safest way to genetically modify cells Finally, the improvements in these animals was significant albeit modest. In order for this technique to come to the clinic, it will have to induce better improvements in heart function. There were modest, albeit insignificant increases in ejection fraction. The ejection fraction will need to be increases for this technique to have a fighting chance to come to clinical trials. Nevertheless, this is a fine start to what might become a new strategy to treat patients with ailing hearts. Stem cells researchers from the Eli and Edythe Broad Center for Regenerative Medicine and Stem Cell Research at the University of California, Los Angeles (UCLA) have shown that a new stem cell gene therapy protocol can potentially lead to a one-time, lasting treatment for sickle-cell disease, which remains the nation’s most common inherited blood disorder. This study was led by Dr. Donald Kohn and was published March 2 in the journal Blood. This paper details a method that repairs a mistake in the beta-globin that causes sickle-cell disease and, for the first time, shows that such a gene therapy technique can lead to the production of normal red blood cells. 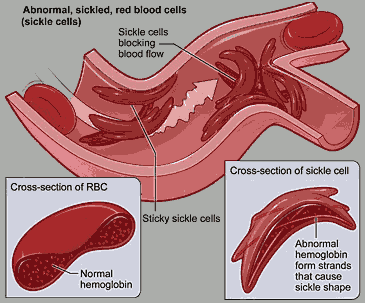 People with sickle-cell disease are born with a mutation in their beta-globin gene. Beta-globin is one of the protein chains that compose the protein hemoglobin. Hemoglobin is the protein in red blood cells that ferries oxygen from the lungs to the tissues and then returns to the lungs to load up with oxygen again and then goes back to the tissues. Red blood cells, which are made in the bone marrow, are packed from stem to stern with hemoglobin molecules, and normally are round, and slightly dished and flexible enough to squeeze through small capillary beds in tissues. The mutation in the beta-globin gene that causes sickle-cell disease, however, causes hemoglobin to form long, stiff rods of protein rather than tight, compactly packed clusters of hemoglobin. These protein rods deform the red blood cells and make them stiff, sickle-shaped, and unable to pass through tissue capillary beds. These abnormally shaped red blood cells not only move poorly through blood vessels, but they also do not sufficiently carry oxygen to vital organs. The stem cell gene therapy method described by Kohn and his colleagues corrects the mutation in the beta-globin gene in the bone marrow-based stem cells so that they produce normal, circular-shaped blood cells. 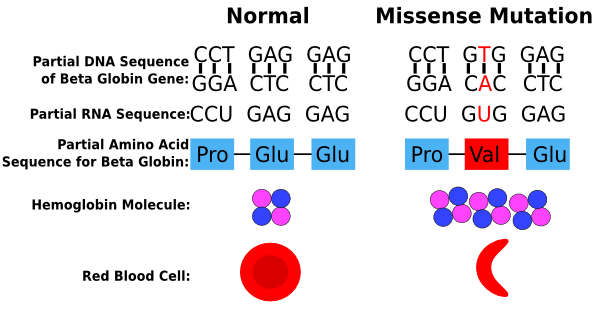 The technique uses specially engineered enzymes, called zinc-finger nucleases, to eliminate the mutation and replace it with a corrected version that repairs the beta-globin mutation. Kohn’s research showed that this method has the potential to treat sickle-cell the disease if the gene therapy achieves higher levels of correction. When a child or adult needs new bone marrow, a bone marrow transplant from a donor is usually the only way to save their life. Without properly functioning bone marrow, the patient’s blood cells will die off, and there will be too few red blood cells to ferry oxygen to tissues or white blood cells to fight off infections. An alternative to bone marrow from a bone marrow donor if umbilical cord blood. Umbilical cord blood does not require the rigorous tissue matching that bone marrow requires because the blood making stem cells from cord blood are immature and not as likely to cause tissue rejection reactions.. However, umbilical cord blood cells suffer from two drawbacks: low numbers of stem cells in cord blood and poor engraftment efficiencies. Fortunately, some progress has been made at expanding blood-making stem cells from umbilical cord blood, and it is likely that such technologies might be ready for common use in the future. As to the poor engraftment efficiencies, a new paper in the journal Blood from the laboratory of Elizabeth J. Shpall at the University of Texas MD Anderson Cancer Center, in Houston, Texas reports a new way to increase cord blood stem cells engraftment efficiencies. As previously discusses, delayed engraftment is one of the major limitations of cord blood transplantation (CBT). Delayed engraftment seems to be due to the diminished ability of the cord blood stem cells to home to the bone marrow. How are cells channeled to the bone marrow? A protein receptor called P- and E-selectins is expressed on the surfaces of bone marrow blood vessels. Cells that can bind these selectin receptors will pass from the circulation to the bone marrow. Thus binding selectin receptors is kind of like having the “password” for the bone marrow. What does it take to bind the selectin proteins? Selectins bind to specific sugars that have been attached to proteins. These sugars are called “fucose” sugars. As it turns out, cord blood stem cells do not express robust levels of these fucosylated proteins. Could increasing the levels of fucosylated proteins on the surfaces of cord blood stem cells increase their engraftment? Shpall and her colleagues tested this hypothesis in patients with blood-based cancers. Patients with blood cancers had their cancer-producing bone marrow stem cells destroyed with drugs and radiation. Then these same patients had their bone marrows refurbished with two units of umbilical cord blood. However, these cells in these cord blood units were treated with the enzyme fucosyltransferase-VI and guanosine diphosphate fucose for 30 minutes before transplantation. This treatment should have increased the content of fucosylated proteins on the surfaces of cells in the hope of enhancing their interaction with Selectin receptors on the surfaces of bone marrow capillaries. The results of 22 patients enrolled in the trial were then compared with those for 31 historical controls who had undergone double unmanipulated CBT. There was a clear decrease in the length of time it took for cells to engraft into the bone marrow. For example, the median time to neutrophil (a type of white blood cell) engraftment was 17 days (range 12-34) compared to 26 days (range, 11-48) for controls (P=0.0023). Platelet (a cell used in blood clotting) engraftment was also improved: median 35 days (range, 18-100) compared to 45 days (range, 27-120) for controls (P=0.0520). These are significant differences. These findings support show that treating cord blood cells with a rather inexpensive cocktail of enzymes for a short period of time before transplantation is a clinically feasible means to improve engraftment efficiency of CBT. This is a small study. Therefore, these data, though very hopeful, must be confirmed with larger studies.